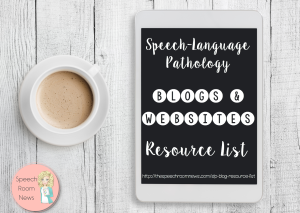 Let’s talk Speech therapy treatment ideas for mini objects! As you know, I’m a big fan of making mini object boxes! 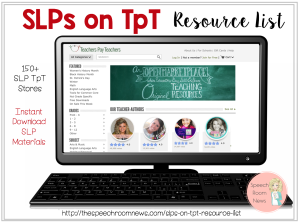 You can create an awesome resource to use in literally hundreds of ways! Literally make it once and use it is a different way each month. 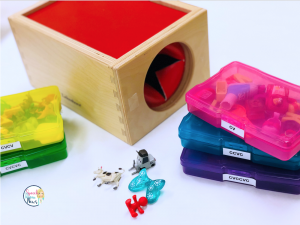 You can see how I created my articulation boxes and my apraxia boxes here. 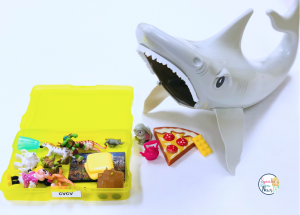 Today I’m sharing eight ways to use the sets for speech sound practice with young learners. 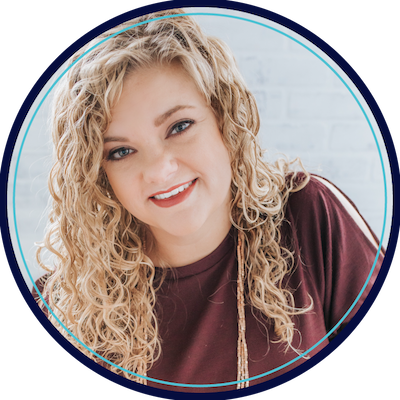 Amazon affiliate links included for your convenience. Use a grabber toy and put the objects in any container. 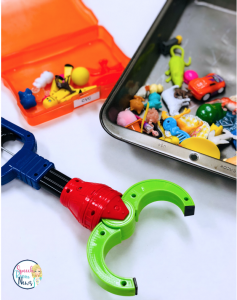 Pick an item to grab (build language by describing one they have to find using attributes or functions) and then try to pick it up with the grabber toy. Get as many repetitions as you can! Talk about which things are hard and which are easier to pick up! Similar grabber toy here. I have a lot of little guys who are super into transportation and you can pair any vehicle with the mini objects. Use a dump truck or airplane and add the objects to it, deliver them somewhere else, and then pick them all back up again! Goodwill is my jam. I love this big shark I picked up. It’s empty and we love to fill it up with mini objects. Talk about what the shark ate or what he doesn’t like to eat! You can do the same with any animal toy or grab the mini trash cans at Dollar Tree that look like animals! Speaking of Goodwill. I got this American Girl Doll Sized Fridge. 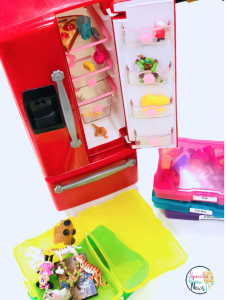 It’s really fun to fill the shelves with the mini objects and talk about what’s in the fridge, what you want to eat, or what belongs/doesn’t belong in the fridge! This Mystery box from Lakeshore can be used for tons of things, but it’s create to hide mini objects inside and pull them out. 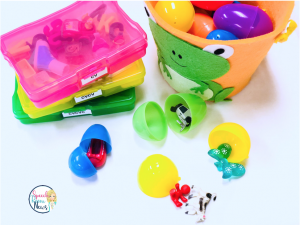 Since it’s spring time, pull out your eggs and fill them with your mini objects! You can hide them around the office or school and go hunting for them! Pull out your trusty Crocodile Dentist and put one object in the middle. Say “eat the __” while you push down the tooth each time. 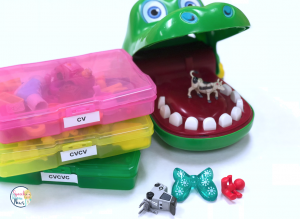 PS – You NEED crocodile dentist in your life if you don’t have it! 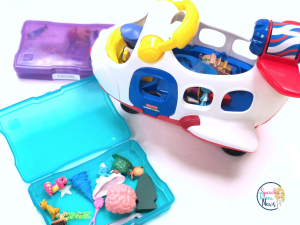 Sensory bins are super easy to grab and throw mini objects in! 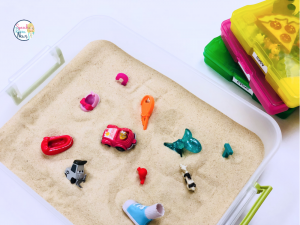 This is my sand bin, just toss in your mini objects and go hunting for them! 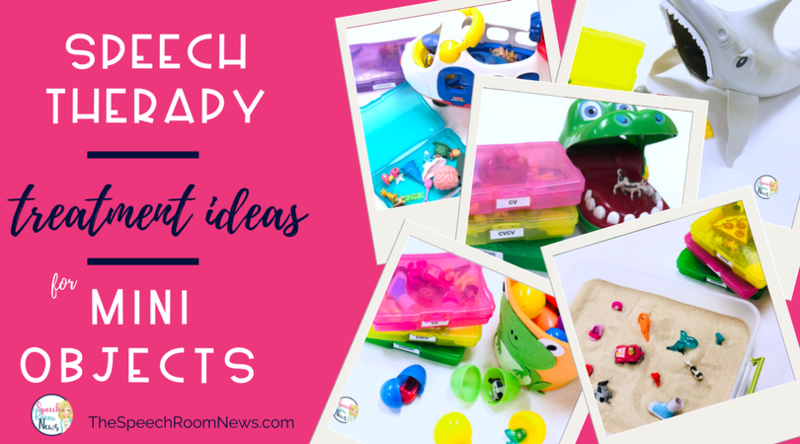 Eight quick ideas for speech therapy using mini objects. I can’t wait see what ideas you share as well! Very fun! I love to put mine in silly putty and the kids dig them out. Keeps them engaged and participating! Great ideas! I also have objects in a clear can and have kids “shake it up” and pick one… then we use the EET to describe each item! Some great ideas. Thanks! For what age/grade levels are you using these? I used Ned’s Head often. Same idea as the Mystery Box. Really wonderful for expressive language. These were all great ideas. I lost all my original minis in a school fire, and I still mourn that loss. Maybe I missed where you mentioned, but where did you find all your mini items? awesome ideas. I’m assembling my boxes now and am so excited! Where did you find the variety of items? I have found animals, but am having a hard time finding other small objects.